Time to say farewell to the Fete du Citron. I had to walk to Roquebrune to retrieve my car. It's almost impossible to find a parking place in Menton on the days of the Corso. 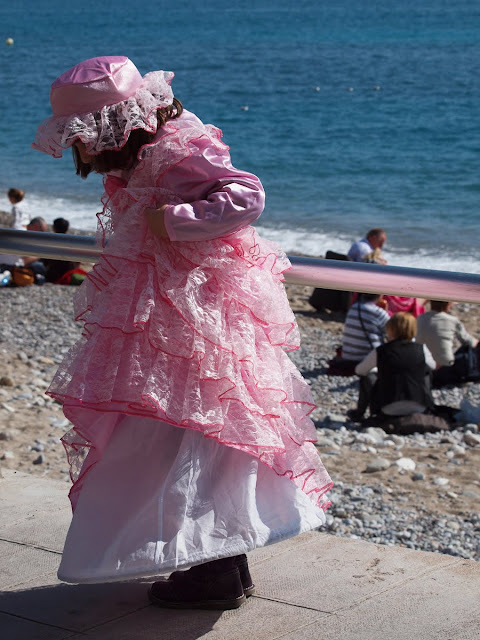 On the way, this little girl caught my eye as she enjoyed her 'pink' day, whilst those in the background relax on the beach. Il est temps de dire adieu à la Fête du Citron. J'ai dû marcher jusqu'à Roquebrune pour récupérer ma voiture car, les jours de Corso, il est presque impossible de trouver une place de stationnement à Menton. Sur le chemin, cette petite fille qui a attiré mon attention appréciait son jour « en rose», tandis que les gens à l' arrière-plan se détendaient sur la plage. Jilly it has been so much fun, can't wait to see what the city burghers come up with next year! the way you've captured her makes me think of little bo peep searching for her sheep. thanks for taking us to the festival again this year. I echo those thanks. It is very fun to see the festival each year. This little miss in her hoop skirt and tiers of ruffles is a cutie. We're glad you had your camera handy. She's adorable all decked out in her pinkness! Thanks for taking us along, Jilly. This festival was one of the best I have seen - thanks to you. A delightful way to end the series, with the very young at heart enjoying the day. If this "service" has been abnormal than I am content to live on the edge. We booked our hotel in Avignon today, with advice from Nathalie. Nice shots of the Fete du Citron, I enjoyed the serie! Thanks for this beautiful series Jilly - I was worried we'd see more lemon floats than I could cope with but your focus on the people has made the festival tremendously enjoyable. You are soooo good at portraits!